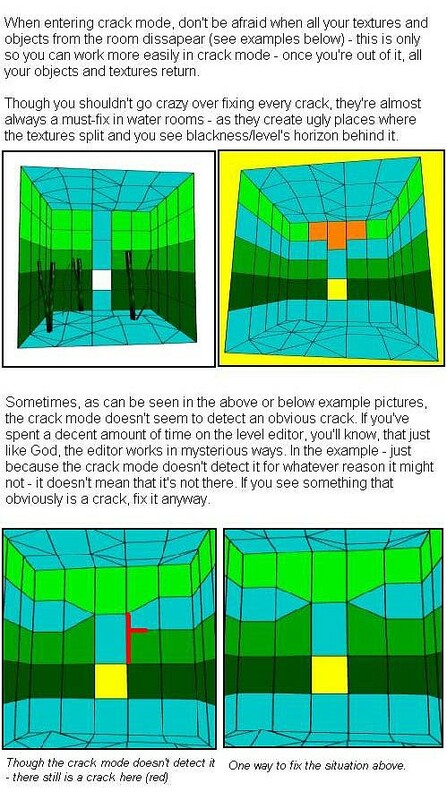 Crack mode is a very useful but under-used feature of the TR Level Editor. Its purpose is to highlight badly aligned texture wall panel segments. When these segments are aligned correctly there are several benefits. 1. It ensures that lighting features of a room have continuity (e.g. shadows and the way light features fall on a wall). 2. It helps eliminate 'cracks' in walls. This can be seen as fine white lines of speckles between wall panels when texture panels are badly aligned. When the wall panels segments are correctly aligned the ugly lines will no longer be visible. 3. 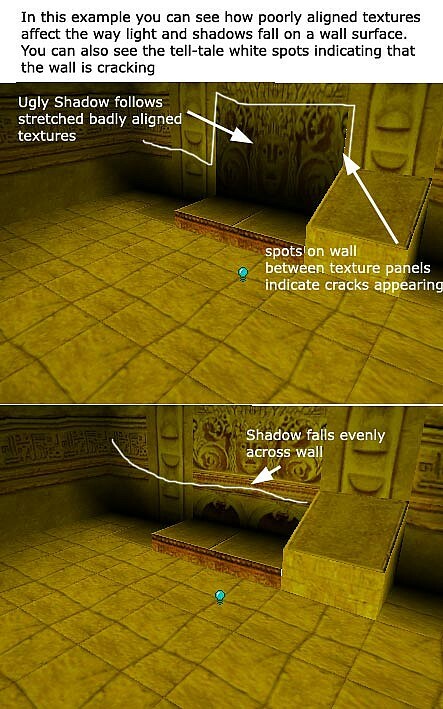 It highlights the gaps in wall panels in underwater rooms, where it looks like the texture panels are splitting apart. When the wall panel segments are properly aligned the underwater wall will appear sealed and no longer split apart. 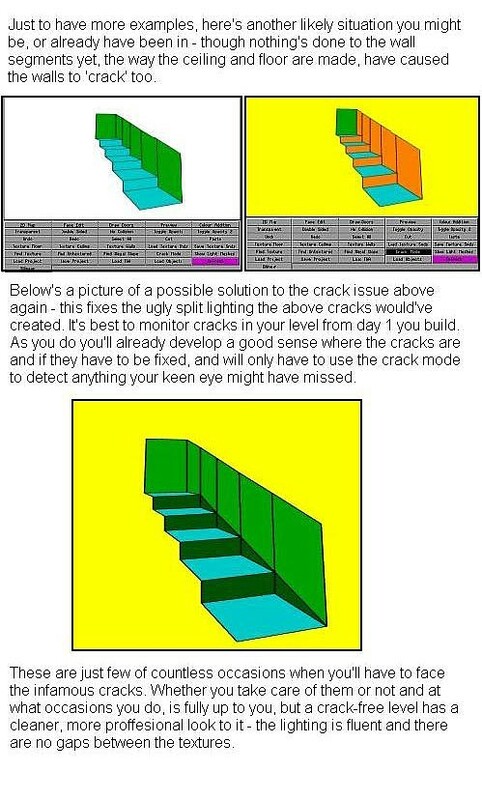 While it is best to use the "Crack Mode" to avoid all cracks (and best done so by checking them from the first day you build the level) you shouldn't go crazy over fixing every one of them. Keep things reasonable - judge for yourself if or how much harm the cracks do - for example if fixing some cracks doesn't go together too well with your architecture or texturing style, no need to fix them. You'll see for yourself though, that it makes a difference in underwater rooms or rooms with atmospheric lighting. 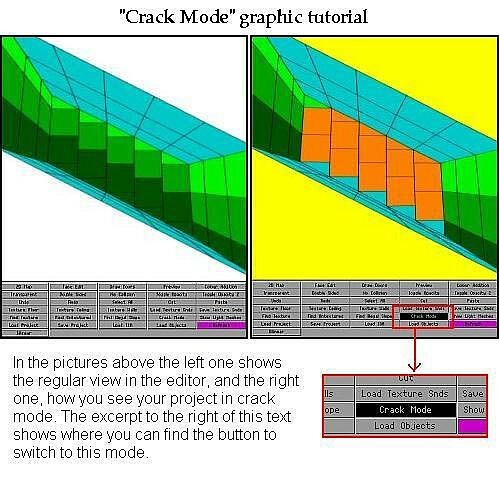 Here are some graphic tutorials that explain the general concepts of crack mode. Hopefully these tutes will help you to achieve a more professional look to your level.